Beautyqueenuk | A UK Beauty and Lifestyle Blog: Yao Yao Cha - The new craze in town! Yao Yao Cha - The new craze in town! 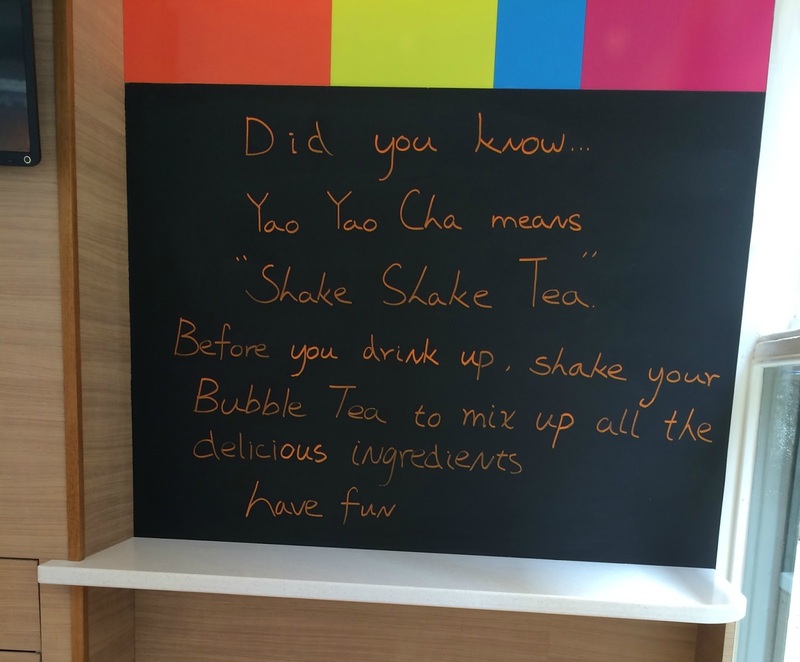 Yes that is right, the new craze comes all the way from Taiwan and it is called Bubble tea! When I was invited along to come and try it out, I jumped at the chance and I am soooo glad I did - here is why! 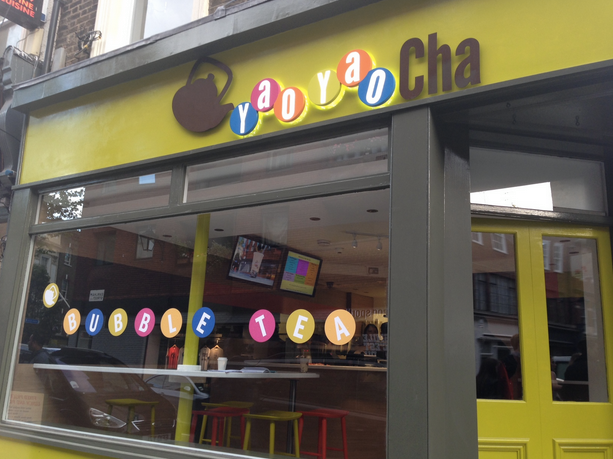 Yao Yao Cha, literally means ‘shake, shake tea’ in Chinese, and the very first bubble tea shop has just opened at 24 Earlham Street, close to Covent Garden. If you live in London or are visiting, I urge you to go and try it, it might just change your life! When I visited Yao Yao Cha, the first thing that entered my head was how bright and airy the shop was, everything is brightly coloured which instantly lifts your mood and it is amazingly cool inside, which in the hot weather is most definitely something you need. I was offered my drink of choice to try and having never ever experienced Bubble Tea I opted for something safe - Salted Caramel, whenever I am in other establishments, this would probably be the flavour I would opt for in any new drink. That drink arrives in a plastic cup and whilst it was being made for me, the mechanics of what would be in it was explained to me in great detail. 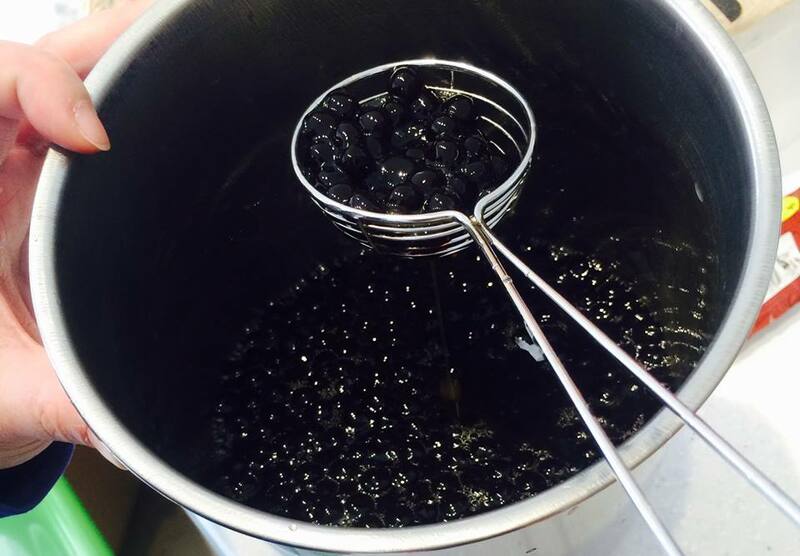 The salted caramel green tea, which also happens to be tea of the month for June, looks like similar products only at the bottom are these round little black balls, these are tapioca balls which go through a cooking process and add some depth and sweetness to the drink you are having. Now when I heard the word tapioca, I was immediatly thrust back into school with one of my favourite frog spawn puddings, all that was missing was some syrup in the middle. These tapioca balls, which are edible, are actually really delicious and I could have quite happily sat there eating them from a bowl. Bubble tea apparently started in Taichun in Taiwan back in the 1980's and Susan, the owner wanted to bring a little bit of home to London and opened her first shop. Susan was absolutely lovely the whole two hours I was in her shop making my way through the menu whilst happily answering all the questions I was throwing her way. I admit that having given up caffeine back in October, I was now obsessed with fruit tea, mainly of the decaffeinated variety, but every now and again if I fancied a brew, I would have one. Whilst at Yao Yao Cha I was more than happy to try everything I could. To name just afew, see HERE for more. Most of these combinations are the cold versions, though I am assured that as winter looms there will be hot varieties (exciting). As well as the main varieties you also have different types of balls which are called fruit pops which are flavoured balls which are full of flavour when you bite into them, cubed jellies such as coconut which I had in my final drink and again they are full of flavour and those tapioca balls which I have already mentioned. Those Balls that are soft on the outside and chewy on the inside – There is a strict cooking process of 4 hours with Susan, if you leave them for too long they come harder and sticky when they should be glazed in honey or brown sugar and soft enough to eat with a slight chewiness to them. Apparently they also differ in size! Well made tea – As there is a skill to making good green and black tea it is all in the brewing. If you leave it for too long it becomes bitter and leaves your mouth feeling strange, almost as though you have burnt the team but on the reverse, if you don't leave it long enough then there is no taste at all – so you should, if the tea has been made correctly, be able to taste the tea even with the flavouring. To check the authenticity, check the Taro Bubble Tea – This fascinated me the most, the Taro tea I had was a beautiful lilac colour and it is quite hard to describe the taste, it wasn't too sweet nor was it too bitter it was perfectly inbetween the two which is the best way I know h0w to describe it. Whilst I was at Yao Yao tea I made my way through a mango and strawberry frappe, a salted caramel tea of the month, a taro tea and the special tea which has been made just for the world cup, though it is very limited edition and the colour, as you can see below is simply amazing and it tastes just like a Caipirinhas but without the alcohol - it is instantly cooling and refreshing and perfect for this weather, but if you want to try it, I urge you to go there right now, because there are just 24 Virgin Caipirinhas available per day. Once they are gone, they are gone! How much are they? Well a regular size tea is just £3.50 and you can go large for just £1 extra. Frappes are just £4.00. The only thing I can say Blogger is that if you haven't been - Go, if you haven't tried it - Try it... it was honestly just fabulous and I am so grateful that I had the chance to go, test and drink as well as have Susan on hand to answer all my questions, as well as brainstorm some weird and wonderful flavours that could be introduced - look out for the July special!! 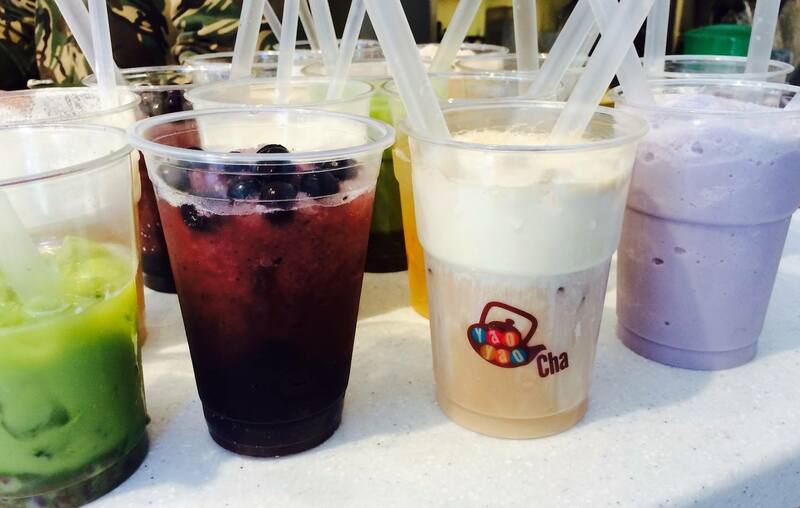 Have you tried Yao Yao Cha yet? I lovr Bubble tea, and being from TO, i got ti experience at a rather youngage and have been drinking it for over a decade. I am so glad it has come to the UK at last. No longer do i have to beg family to mail me some to drink this delicious libation. My personal favourite is honey dew melon with tapico pearls, as opposed to popping boba. My taste of heaven. Ahhh. I actually have some at home, i think i may make some today. Haha. This looks really yummy, will have to give this a go, as I am a general tea addict. Interesting!! I've never heard of this, I don't think we have it in the US. I can't believe all the different varieties!